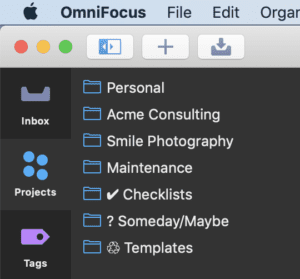 Create structure in OmniFocus by applying the insights from mind mapping your responsibilities. In this article we'll look at how to structure OmniFocus based on a mind map of your responsibilities in life. If you haven't already, I recommend reading the Foundation: Mind Mapping Your Responsibilities article before moving on to this one. This mind map serves as a handy starting point for structuring OmniFocus. As a minimum, I recommend creating a folder for each of your major areas of responsibility so that you can easily focus in on these areas as needed. 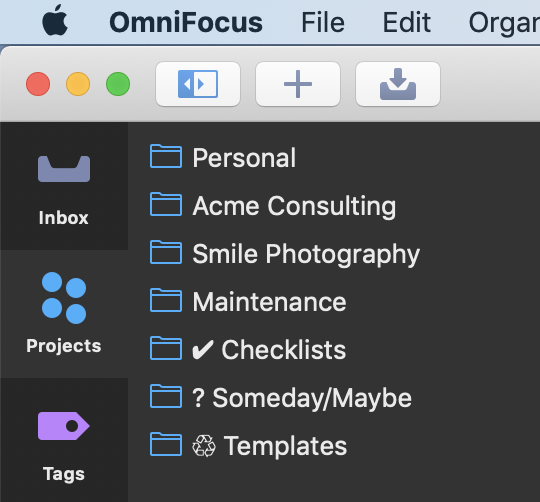 This is especially useful when using in combination with the Focus feature in OmniFocus 3 for Mac (Pro) and the Custom Perspectives feature that's available on both Mac and iOS (Pro). A fourth folder called "Maintenance" is used to house projects and actions that help keep your system up-to-date. For example, "Perform Morning Review" and "Perform Weekly Review". There may also be top-level folders to encapsulate Checklists, Someday/Maybe items, and Templates.